Chronicles is a template for churches and non-profit organizations that is built with love and care by datcouch.com. Template is fully responsive and also retina ready. This theme to look extremely crisp on mobile devices with retina display, like iPhone and iPad. 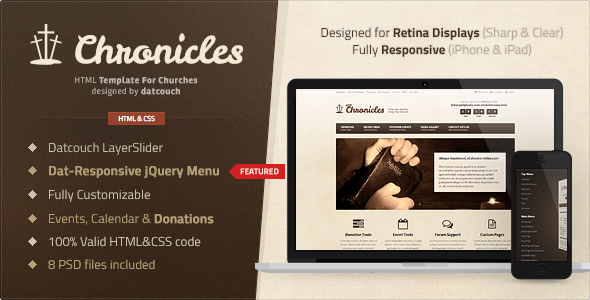 Item Reviewed: Chronicles Church & Donation HTML Template 9 out of 10 based on 10 ratings. 9 user reviews.